Another day, another gondola (literally). 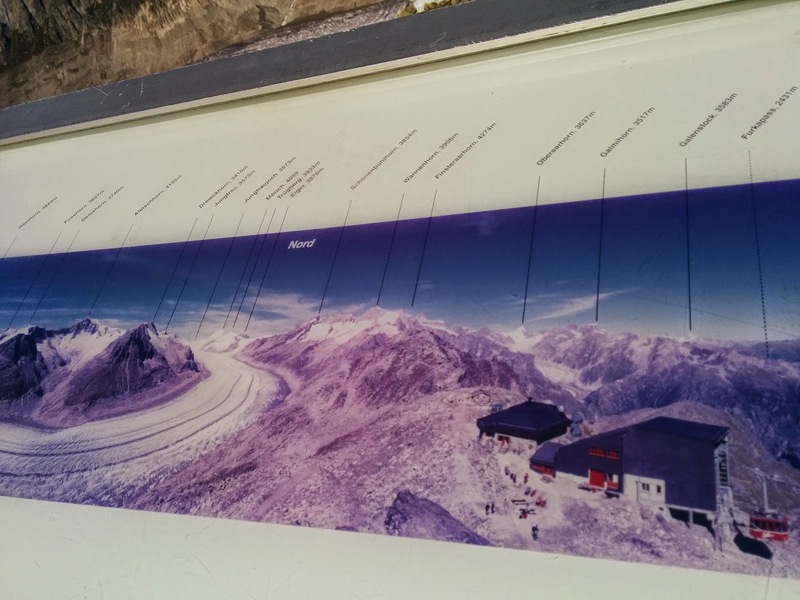 This time the main attraction was the Aletsch glacier. 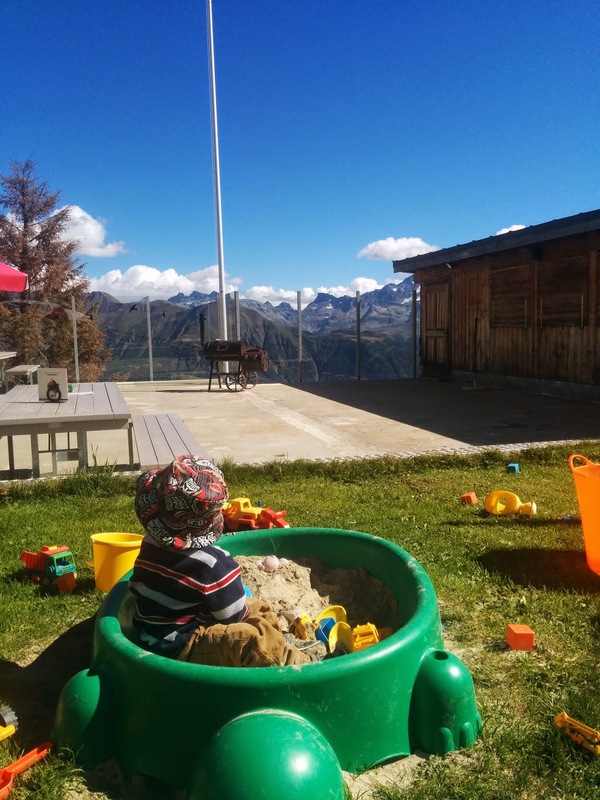 We drove from Saas Grund to Fiesch for the gondola to the Eggishorn. The Aletsch glacier from the Eggishorn at its most spectacular angle. i.e. the elbow. The Aletschhorn is the high mountain in the center. We were spectacularly lucky with the weather to have such a clear day, so also visible here were the Jungfrau, Jungfraujoch, Mönch, and Eiger! This immense view was my favourite view of all the many mountains and glaciers we saw in Switzerland. The view out the other direction was no slouch either. There is a great walk from the Eggishorn to Bettmerhorn, where you can take a different gondola down. We totally would have done this had we been sans kids. As it was, even if they had been OK to sit in the carriers for a few hours (which they weren't) it would have been sketchy to carry them: lots of loose footing and steep drops. Pointy top is the Matterhorn, and on the right, the Weisshorn. Also from the "if we didn't have kids with us" files: the via ferrata here looked amazing. You can see some people finishing it on the left here. On the way back down we stopped at Kühboden, which didn't have any Kühe, but had lots of restaurants with playgrounds attached. Which made everyone involved very very happy. 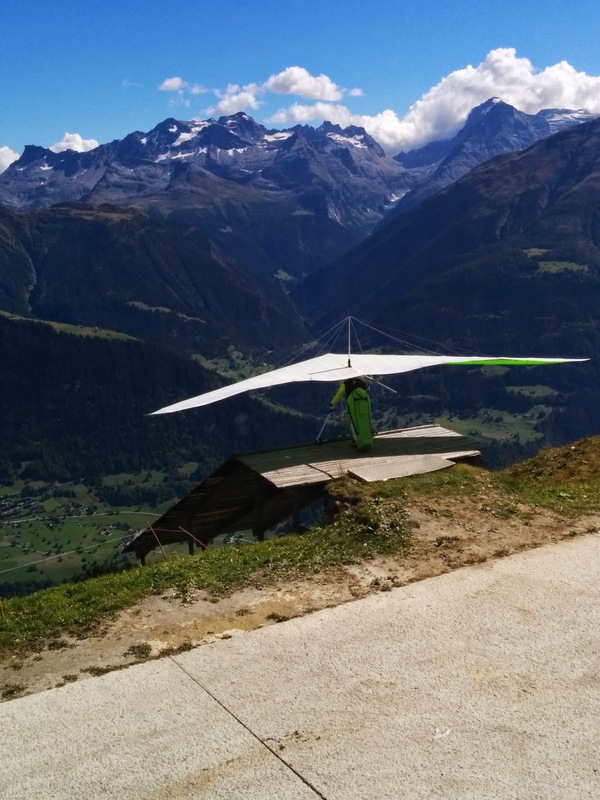 We watched a bunch of paragliders and hangliders launch while we were having lunch. On the way home we made a stop in Saas Balen to see the waterfall and an old pretty church. We mostly ended up closely inspecting a hay baler and some sheep though.